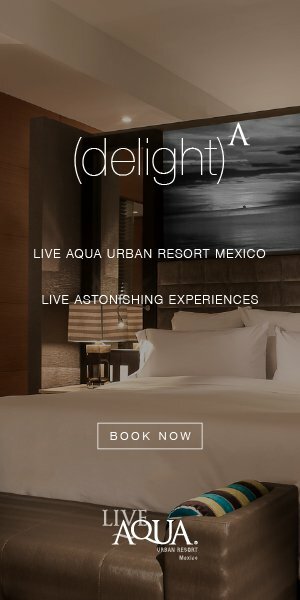 Of all the boring dinner parties you’ll attend, this is one you do not want to miss, even though the food’s not for you. In fact, the guest list doesn’t even have any humans; this is an invitation-only feast reserved for Lopburi’s population of 2,000 macaques. The tradition started in 1989, when Yongyuth Kitwatananusont decided to thank the local monkeys for bringing him years of business at the Lopburi Inn. Monkeys have always been a subject of veneration in Hindu Asia because of Hanuman, the monkey god who rescued the kidnapped Sita, wife of Lord Rama. Today the macaques of Lopburi congregate at Phra Pang Sam Yot Temple among the ruins of the Khmer Empire. 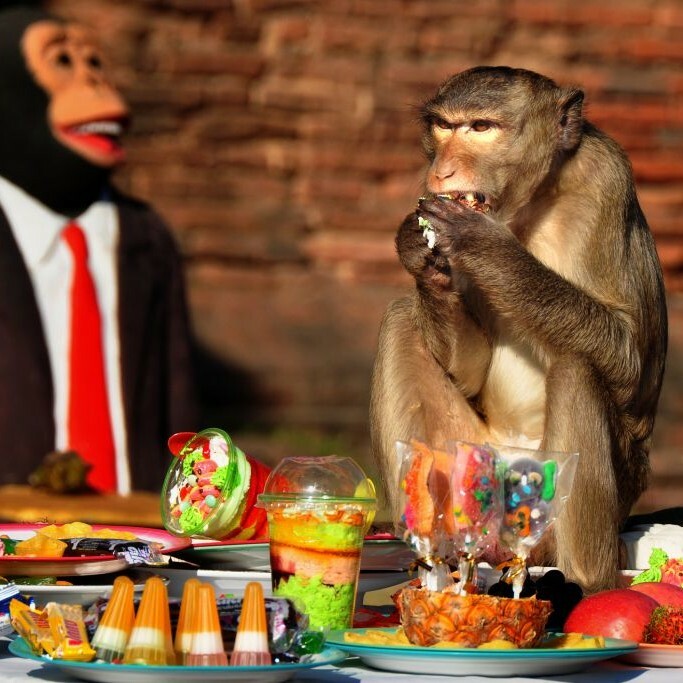 Believing kindness to monkeys brings good luck, Lopburi invites their neighbors with cashews as the head chef prepares a vegetarian feast of rice, fruit salad frozen in ice blocks and thong yod, or gold egg-yolk drops,” considered one of the nine auspicious desserts of Thailand. The festival begins in the morning at 10 a.m., where locals perform music and dance numbers before a speech by the Governor of Lopburi. 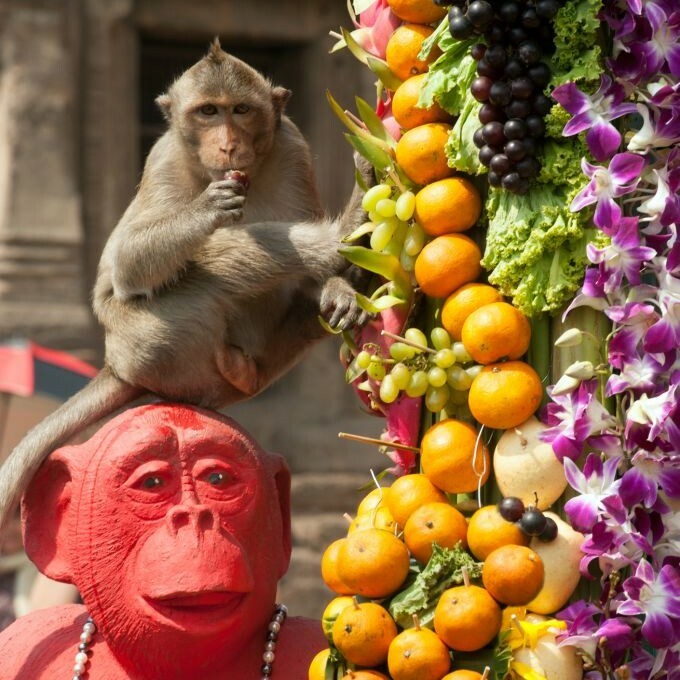 The monkeys make their way toward long tables dressed with red cloth and filled with food. They are surprisingly timid, especially in front of the hundreds of people watching, but soon overcome their shyness and dig into the feast. Soon all modesty is lost and the monkeys become the life of the party, dancing on tables and flinging food and drinks at each other. There is more than $15,000 worth of food on the menu, which features 20 kinds of fruit, including the flavorful and expensive durian fruit, a favorite of the monkeys. Some try to lick their way into the dishes encased in ice, while others run amongst the spectators stealing bags and wallets. Once the monkeys have had their fill, they climb to a comfortable spot in the trees and take a nap without so much as a thank you. The townspeople don’t mind, as the feast has afforded them another year of good fortune.